UPDATE: The Powderfinger reunion at Splendour was “absolutely a one-off”, says Bernard Fanning. ORIGINAL STORY: Members of Aussie rock heroes Powderfinger have reunited at Splendour In The Grass in Byron Bay this evening, and there’s footage to prove it. 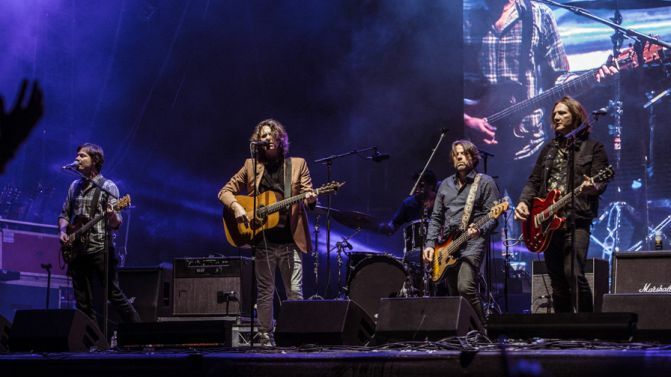 “It’s been 10 years since Powderfinger played at Splendour, so let’s have a little anniversary party,” Bernard Fanning told the crowd during his Splendour solo set, before his former bandmates (sans their drummer Jon Coghill) joined him on stage and kicked into their classic track ‘(Baby I’ve Got You) On My Mind’. The band went on to play their other hit ‘These Days’, before Fanning wrapped up his solo song ‘Wish You Well’. Catch footage of the Powderfinger tracks and photos from the band’s performance, below. The same four fifths of Powderfinger actually reunited to perform together in Brisbane in 2015. The band haven’t performed together as a whole since 2010, though. Powderfinger fuelled fresh reunion rumours last year, after launching a new website chronicling their history as a band.